Ask fellow campers about "Indian Trails Campground" and nearby attractions. Perfect family camping in WI & regret I didn't find this sooner. This campground has about 300 sites with half been seasonal. Most sites are very large, but fairly open because the trees are old and tall. There is a 15 acre lake/pond for fishing or small boat paddling. Very scenic day or night. There is a smaller pond where large inflatable play area is perfect for teenagers. Another concrete outdoor pool 4-5', another smaller toddler pool, and a typical hotel type indoor pool with an 8' deep well on one side and 3-4' on the other side. 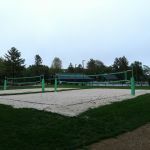 Free outdoor activities include; full basketball court, multiple volleyball pits, GaGa Ball, Shuffleboard, BMX bike course, and hiking paths in and out of the park. 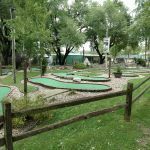 Miniature golf for under $5 and is maintained and appropriately price. Two dogs runs that are for separate dog sizes. 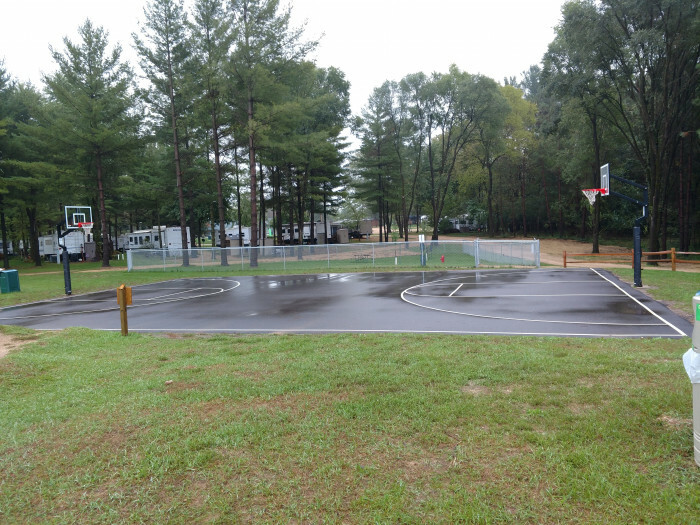 Every building and feature of this campground is maintained above typical campgrounds. Bathrooms very clean and showers are individual from outside. In my opinion this is the perfect family campground, especially for groups. If this park wasn't enough, WI Dells and Baraboo are very close. The only warning, this is truly a family/dog friendly park. So if you are into loud music, heavy drinking, late night partying, not obeying pet rules, you will quickly hate this place. The owners are awesome and very caring to make this a great family experience. The price would normally make me blink, but is reasonable being in the area of WI Dells and for what it offers. We camped at Indian Trails Campground in a Fifth Wheel. Baraboo Zoo has a free zoo that is small but a nice visit for toddlers. Also the McKenzie Environmental Center we did not attend due to weather, but was told it was another great free place to visit. This is a nice clean park. Spaces are a little close and fairly level. Internet is non-existent and phone service is at best spotty in the campground with ATT. I'm still surprised that CG don't have internet around the area for their customers. My rate is for 3 nights with one free---so approx. $56.oo per day. We camped at Indian Trails Campground in a Motorhome. We have stayed at this park at various times of the year. At all times we have found the staff friendly, courteous, and respectful. That being said, this is a well patrolled park. If you are looking to get drunk, loud and obnoxious this is not your park. If you are looking for a park that is family friendly, respectful - quiet hours are quiet hours, clean, well laid out with plenty of activities. All are welcome from tents to Class A's. Most waterfront sites are easily accessible to all except for some large 5th wheels or Class A's. We will camp here again. We camped at Indian Trails Campground in a Travel Trailer. Large Amish settlement just north of the campground. Nice camp store and restaurant. Small town with a full service grocery store just minutes away. For anyone traveling distance, reasonably close (10 miles or so) to the Interstate. 20 minutes to Madison or the Wisconsin Dells. Another wonderful stay at this campground....very fine people, and very well run..
Loads of things to do for kids We camped at Indian Trails Campground in a Motorhome. This was our second stay at Indian Trails, this time for a fall weekend. We purposely stayed here for the indoor pool, which is nice but was freezing cold. It's also difficult to sit and watch the kids with the overpowering chlorine smell. 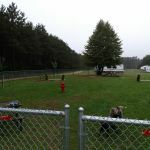 This campground has a lot of amenities, including a miniature golf course with a steep price of $17.00 for a family of four. We stayed on a site at the west end of the campground, which backs to the wooded area and hiking trail. These sites are nice and wide, but are poorly designed with the electric at the front of the site and the water/sewer at the rear. They are also very uneven from side to side and require a lot of leveling blocks. Bathroom cleanliness was average, and showers are only one temperature and can't be adjusted. 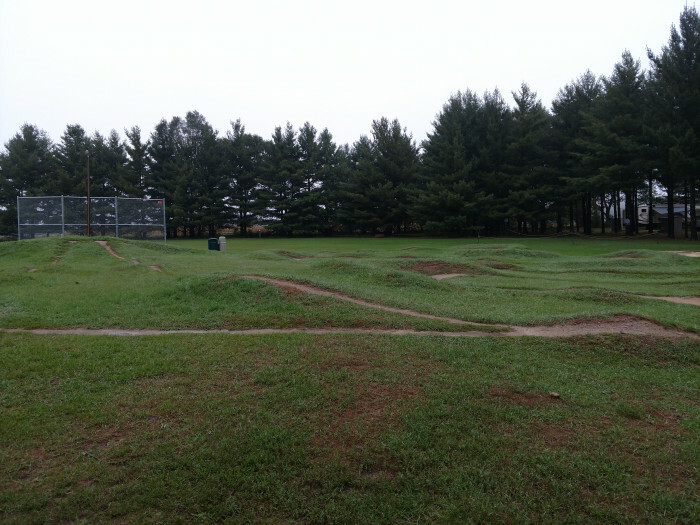 The dog park is great and the kids really enjoyed the BMX track. We will stay here again. We camped at Indian Trails Campground in a Travel Trailer. 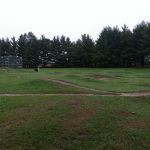 We have camped at Indian Trails almost annually for a number of years and are continuously impressed with updates and improvements. The family that owns it are on the spot and attentive to everyone. They make you feel like you are the most important camper to them. There is such a variety of activities for kids, quiet areas for adults, and sites are spread out. If you want to have a group together, they can accommodate. If you want to have a quiet weekend with a spouse along the water, they have a spot for that, too. Showers, restrooms, pits are available throughout the park. Speed limits, quiet times, and good camp etiquette is given priority. Schedule activities abound or you can just settle in. Have recommended this camp and will continue to do so. We camped at Indian Trails Campground in a Travel Trailer. Most of the sites are of good size. We have a 33' 5th wheel and had a lake front site with plenty of room. The store is well stocked with general supplies, and the staff is always ready to help. The restaurant service was very slow when we were checking out, but the food was good. My advice book well in advance if your going to stay's a great place and they fill up quick. We camped at Indian Trails Campground in a Fifth Wheel. We stayed here for Heroes weekend, and even being full, the campground was quiet and did not feel overcrowded. 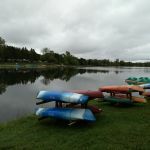 The kids enjoyed the clean swimming lake, indoor pool, hiking trails and BMX track. The main building has a nice camp store, with food, ice cream, candy and video games. The staff was very friendly, and were always keeping up on the cleaning. We camped at Indian Trails Campground in a Motorhome. I would give a 10 but bathrooms could use a little more attention. It was well stocked but not really cleaned thoroughly, spider webs and general cleaning not the best. Cleanest fire pits I've seen, they started cleaning at each site at 8 am. Nice hiking trails and swimming pond has all kinds of inflatables for the kids. Fishing was good and indoor pool was very nice. More detail to restroom would get a 10. We camped at Indian Trails Campground in a Tent Trailer. This park is as nice as you will find. We were lucky enough to snag the best waterfront site there. Restrooms/Showers were all new and clean. There are two dump sites that were both clean. We had their Friday night fish fry and it was very good. All the staff were friendly. We had waterfront with water and 30 amp electric service. We'll definitely be back again soon! 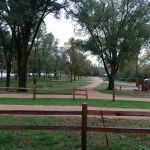 We camped at Indian Trails Campground in a Travel Trailer. This is an excellent campground, it would be wonderful for a family or for just a couple. 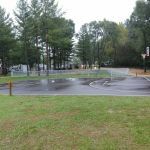 There are plenty of things to do around the campground, mini-golf, arcade, indoor swimming pole, outdoor natural swimming hole, free private fishing and boating. Each weekend there is a theme and activities that are associated with the theme. 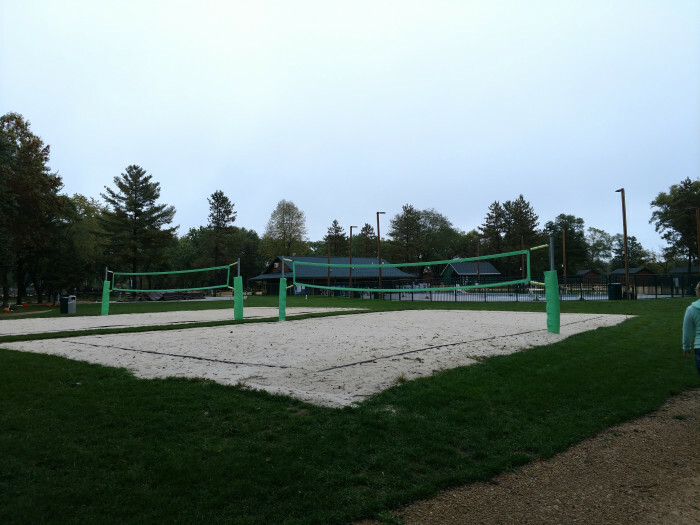 The restrooms were not maintained well through the rainy weekend, they did not step up the maintenance of keeping the sand and moisture under control. The new bathhouses are nice, the old are maintained but they were built under a different standard. We got a call about a week before our stay from the office staff, they wanted to upgrade our site and move us to accommodate a family reunion that was forming around out site. That was really nice of them to do the family and for us, I appreciated that attention to detail and trying to make everyone happy. The one complaint I have is the signage from the North and West is bad, we mentioned it to the office and they seemed to not care and mentioned no one ever comes from the North! Hmmm, we did? We camped at Indian Trails Campground in a Fifth Wheel. Outstanding RV park. 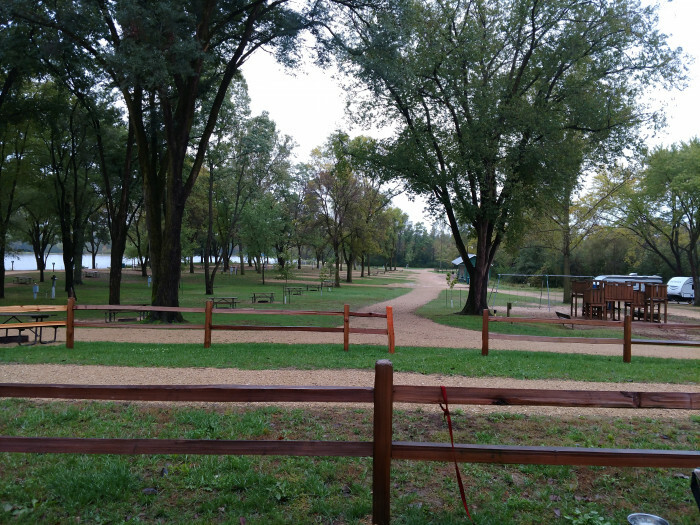 Being new to RV parks and having camped only at a few places last year, we thought places like this was the norm - excellent camp store, basic restaurant, arcade/game room, mini golf, swimming, nice lake to walk around or fish on, and nice big shade trees. Then we camped other places in Wisconsin and Missouri this year, and found out just how special this place is! It's like the Hilton of RV parks! And don't even get me going on the fresh-cooked donuts on the weekend! You can go to camp here for several nights, and never need to leave to "find something to do". Details: good site, hookups (except no sewer where we were this year and last year) and level. Did have to back in. WiFi at clubhouse actually reaches out to the campers near it as well, so I could get work done, too. Excellent store and staff. Very nice walking or biking around the lake, takes at least 60 minutes, depending on how often your kids stop to play at the several playgrounds! (probably a 30 minute stroll, otherwise) Very nice mini golf. Little car racetrack. Swimming pond and fishing lake (rowboats only). Indoor HEATED swimming pool, which is really nice in Wisconsin's fickle weather. VERY kid-friendly. Clean and well-kept without being at all oppressive, as some parks are. Downside - no sewer hookup at the sites close to the clubhouse. Not a lot of pull throughs. Overall, we plan to go there at least once a year for the foreseeable future. Hoping to camp with some friends side-by-side, too. We camped at Indian Trails Campground in a Travel Trailer. Nice well maintained park. Sites are decent sized. The indoor pool is a nice touch however they have many many rules. Food in the restaurant was almost inedible but the ice cream more than made up for it. There is a large lake for fishing, non motorized boat rentals, mini golf (about $20. for a family of 4), lake with inflatables and more. Overall this was a nice campground with decent amenities. The main shower house could use an over haul. The owners are constantly cleaning, mowing, leaf blowing and this is an exceptionally clean park. We camped at Indian Trails Campground in a Travel Trailer. 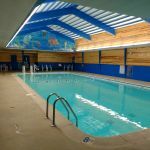 We normally prefer State Parks to private campgrounds (space, hiking, quiet, etc), but with 101-degree temps forecast, we thought an indoor pool sounded nice. Reviews here were pretty positive about Indian Trails so we called and got a site (coming in Sunday afternoon wasn't a problem - but weekends book way in advance). We had a great time! The site we got was large and was a real lake front. The breeze off the lake helped us stay cool. CG was very well maintained - all tables, firepits, facilities, utilities, etc were in excellent condition. As a family we went swimming in their indoor pool (very nice pool), hiked around the 15-acre fishing lake, and played 18 holes of minature golf (fun course, will need maintenance later this year). After the 9th hole, we were pretty hot so went into the office where they had a nice restaurant for some slushys before doing the "back 9". Activity prices were reasonable. Folks at the CG were very friendly; they have a LOT of repeat business and apparently advertise very little. CG was peaceful and we got 3 nights good sleep. Most sites are pretty good size; some are more attractive than others. If you're in a big rig, make certain they know - there are many sites that are fine for a popup but a Class A would have a hard time getting level in them. We all agreed this was a "destination" campground - one to which we will likely return. We camped at Indian Trails Campground in a Motorhome. This what I belive to be one of our families favorite campgrounds. We have gone every year now for the past 5 years. The sites are reasonably sized. Office, store, restaurant, indoor pool are clean and have everything you need. Very extremely courteous & friendly staff. Love the indoor swimming in the cooler weather. Kids LOVE the fishing & playground. It is a given that this is on our list to visit every year! 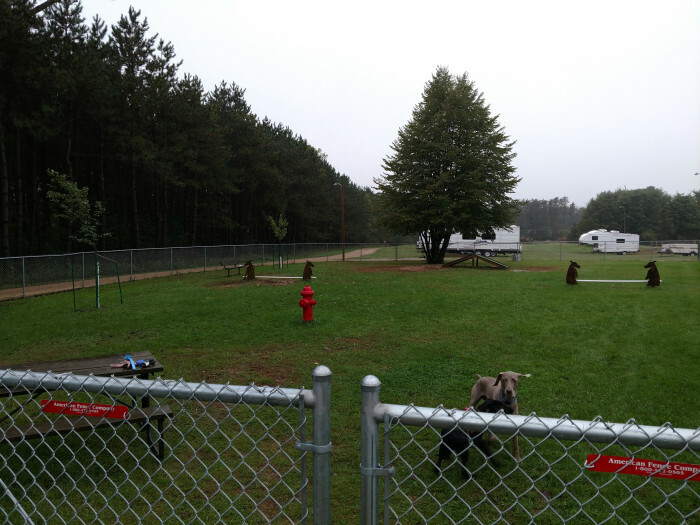 We camped at Indian Trails Campground in a Travel Trailer. Are you affiliated with Indian Trails Campground ?